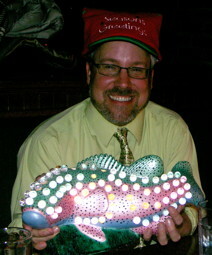 If you have ever been to a Rocky Mountain Flycasters’ Holiday Party, you know what a great time it can be. Tales of fishing exploits the previous season or seasons past flow freely. C.B. & Potts has been able to provide some wonderful eats. The White Elephant gift exchange can produce some interesting highlights as people vie for gifts that they might like. The fly trees that are raffled off often have more than 60 flies each. A brand new fly rod in the raffle adds to the excitement. We hold the party early in December of each year at C.B. & Potts’ Collindale, at 1441 East Horsetooth Road. We start socializing at 6:30, eat from 7:00 to 8:00, then have the infamous White Elephant Gift Exchange, raffle drawings for the two fly trees and a fly rod. We try to keep the cost down by preordering tickets. Late registrations involve for work for the C.B. & Potts staff so we need to charge a bit more. Everyone will get heavy hors d'œuvres from the C.B. & Potts kitchen and raffle tickets. If you wish to participate in the White Elephant exchange, plan on bringing a wrapped white elephant gift. Because of our larger attendance, please bring only one gift per couple. We always have a great time at these parties, and it is especially good to meet and socialize with our significant others. We also ask that you bring a few flies and divide them between the two trees as we will raffle two trees again this year. We had a great turnout of flies last year as well as a huge pile of White Elephant gifts. When the date has been set, we will ask that you order your tickets here via PayPal. We try to keep the online ticket sales open as long as possible but we will need to cut them off some days before the Party. We really hope you all can attend! Trout Unlimited’s mission is to conserve, protect and restore North America’s trout and salmon fisheries and their watersheds. TU accomplishes this mission on local, state and national levels with an extensive and dedicated volunteer network. Rocky Mountain Flycasters is your local chapter of TU. Find out more. Visit W3C and CSS for standards compliance. Best viewed with web-compliant viewer. Handmade Art Co.